One thing you can rely on here in the UK, the weather is always changeable. We had glorious warm spring days lasts week and after four days the weather changed back to being rather cold, damp and chilly. The weather had me thinking about picnics and BBQs but then with a change to colder weather I was planning warming soups. What could I bake that would suit both? After much pondering I decided on Ciabatta. This bread is a non bread bakers bread. 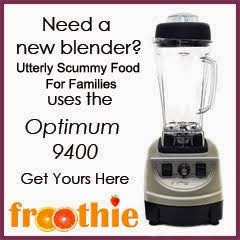 The method is simple, children love the mixing and beating process and it is relatively quick to make and bake. Ciabatta is brilliant for sandwiches or as an accompaniment soups and stews, it is also a fab breakfast on the go option - you don't even need to toast it. You can make this dough the night before and leave it to prove overnight in the fridge so you can bake it in the morning. I do this often as I have to fit my bread baking in around everything else and I have a very busy family life to live. Dough will still rise in the fridge, just at a much slower rate than usual. If you do decide to prove the dough in the fridge make sure you take the dough out of the fridge an hour before you want to bake it. This will allow the dough to come to room temperature and will result in a better loaf. Put the yeast, flour and sugar into a large bowl. Pour in the water and salt. Mix for 5 minutes, either with a mixer or a wooden spoon, until everything is well combined and a dough has formed. The dough will be very wet, do not panic! It will have the consistency of thick pancake batter or cake batter rather than the consistency of a sandwich loaf dough. When the dough is well combined, oil or flour your hands, stick them in the bowl of dough and pull parts of the dough up above the bowl then slap it back down into the bowl. Do this for another 5 minutes. Making the dough by hand using this lift, stretch and thwack method is not only a good work out and a great way to work out the frustrations of the day; it will push air bubbles into the dough and create the airy texture of the Ciabatta as it bakes. You could knead it with a dough hook for an extra 5 minutes but to be honest the texture of the finished loaf isn’t as good and it certainly isn’t as much fun as thwacking the dough around by hand. A word of warning - the dough will stick to even the most thoroughly floured hands. Should you make this with your children they may have the overwhelming urge to stride about the house with dough covered fingers pretending to be a monster from Scooby Doo. Should this happen deal with the situation calmly and quickly. March them to the sink to clean up whilst making sure they don't go near soft furnishings. Don't say I didn't warn you! Once the dough has had a good 5 minutes of grab, lift, stretch and thwack treatment put it into a large oiled bowl then drizzle one tablespoon of olive oil over the top. Cover with clingfilm and leave until doubled in size. This usually takes about an hour in our house. Line a baking tray with baking paper, then sprinkle it liberally with flour. Carefully transfer the dough to the tray, do not knock it back! You want all the lovely air bubbles to stay in the dough. 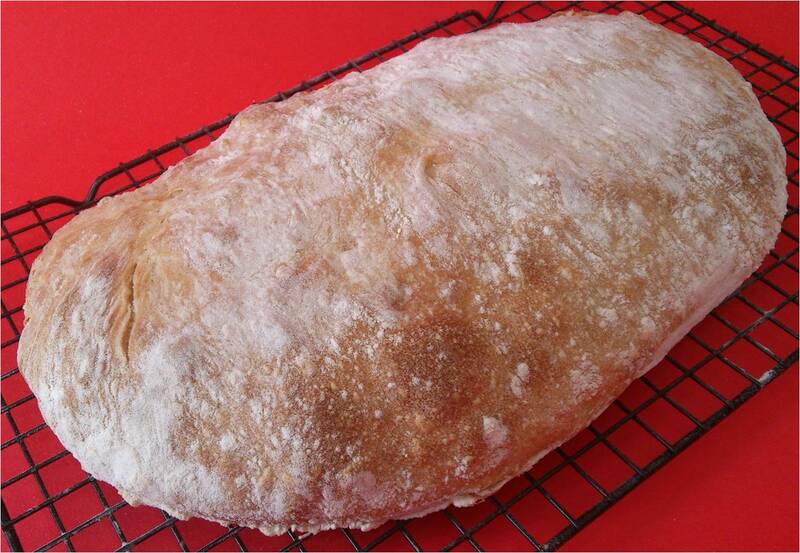 Fold the dough into thirds to create the classic Ciabatta shape. Sprinkle the top of the loaf with a dusting of flour. Bake for 30 - 40 minutes, until the bread is lightly golden and sounds hollow when tapped on the bottom. Transfer the bread to a cooling rack and leave it for at least 30 minutes before attempting to slice into and devour your lovely loaf. As well as my Ciabatta being the Fresh From The Oven Challenge for this month, I am entering it into other blog challenges as well. Credit Crumch Munch is a thrifty recipe blog hop created by Helen and Camilla. Janice from Famersgirl is hosting this month. This Ciabatta recipe is perfect for Credit Crunch Munch because it's so much cheaper making your own Ciabatta than buying one from the supermarket. A 1.5kg bag of strong white/bread flour costs me 80p from Asda and I can bake 3 loaves from it. 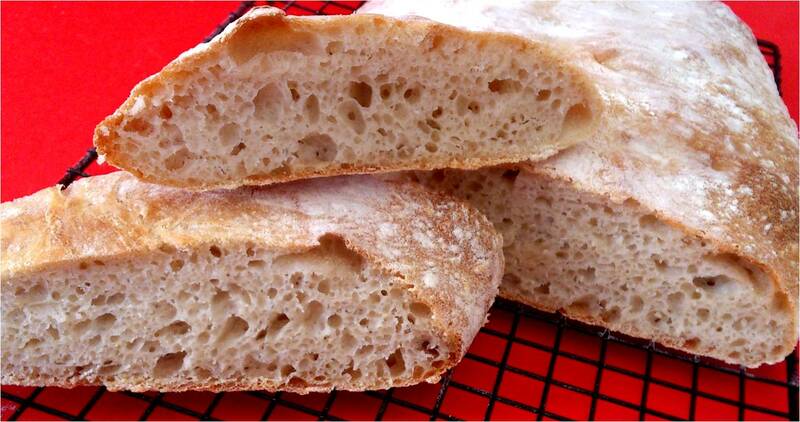 To buy a Ciabatta from Asda costs £1.30 or between 25p - 33p for Ciabatta rolls. Clearly making bread yourself is well worth it from a money saving point of view, not to mention it is loads of fun and you know exactly what goes into it. Breakfast Club was created by Helen from Fuss Free Flavours and is being hosted this month by Katie over at Feeding Boys. We have Ciabatta cut into soldiers and dipped in soft boiled eggs for breakfast, it is delicious! I am also a fan of a slice of Ciabatta spread with Vegemite, sprinkled with cheddar and lightly toasted until the cheese melts or spread with homemade jam and devoured in a hurry as an easy breakfast on the go. I have also submitted my Ciabatta to Yeast Spotting which is a weekly showcase of yeasted baked goods and dishes with bread as a main ingredient. And finally I have submitted my Ciabatta to Bake Your Own Bread which is similar to Fresh From The Oven but is US based. What a professional looking loaf. Thank you for teaching me how to make ciabatta as I had no idea Michelle. This looks like a job for me and my daughter one day:-) Thanks for entering Credit Crunch Munch. Thanks so much for sending this to both Credit Crunch Munch and Breakfast Club Michelle. I'll get Ed to make me one, now that he seems to have become the baker in the household! HI! I made this last night (put in the fridge) but the dough wasn't wet? I don't really understand...also, what kind of yeast did you use please? Hiya, I used the instant yeast sachets you can buy from the supermarket. I haven't tried leaving the dough overnight in the fridge. Perhaps it changed texture with having a much longer rise in the fridge? Oh sorry, I thought you had as it says in the introduction that it can be left in the fridge overnight and that you do that often. When I was describing the dough, I meant as soon as I put it altogether in the first step, the mixture wasn't wet. It was like a normal dough. You're right, I'm sorry I do leave the dough overnight in the fridge. I thought this was a different bread post. Clearly I shouldn't answer blog comments after a 12hr work shift. It will look and feel more like a normal dough after a night in the fridge. It should bake the same, just don't knock it back or knead it too much. The dough is easier to manage after being in the fridge overnight. Oh Michelle, I have just re-read what I wrote and the first line sounds really condescending! Not at all how I meant it to sound in my head! That's the trouble with written communication, it can be interpreted in any number of ways. Not being one to give up, I shall be attempting it again! The dough looked and felt like a normal dough prior to fridging so I am thinking the room was probably just too hot and that I should have added more water. I did make it up in 30+ heat! Unrelated to this recipe, but do you think the material of the bowl affects the dough during proofing time? i.e. metal vs glass vs plastic bowls in a warm room?